A former Catholic Monastery deep in the Dutch countryside is not where you would expect to find one of the brightest talents in American cyclocross. 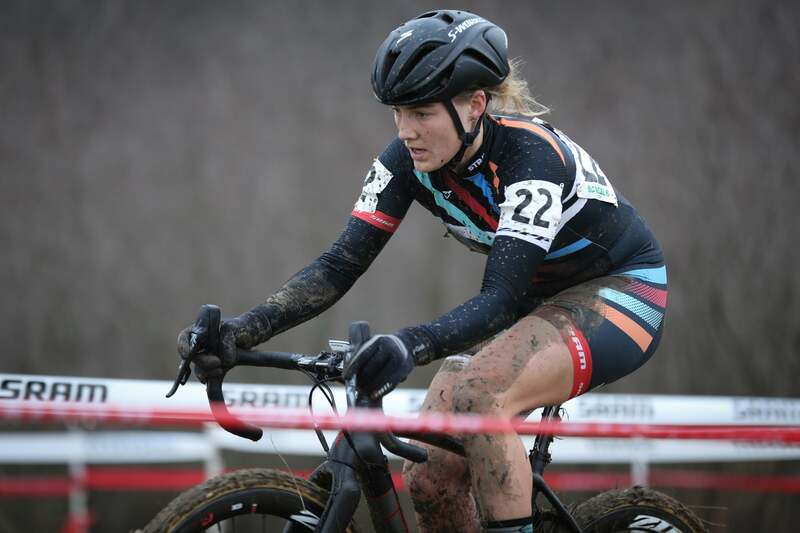 But through the Christmas period the Watersley Sports Park, based around the 17th century Watersley Huis, has been home for Elle Anderson (Strava/SRAM) as she pursues her dream of European cyclocross success. Riding for the USA national team, Anderson has joined Geoff Proctor’s legendary Cross Camp. And while some of the younger members of the team seem a little shell-shocked at being plunged into the European scene, for Elle this represents a return to a place she has a deep and complex connection to. In the bleak midwinter, days here are short and the sky is leaden. Rain is ever-present, the sun has gone south on its winter training camp. Riding takes in flat roads through beet fields, where the most interesting feature is the wind. Or through dark forest paths. All very different to the San Francisco from which Anderson hails, but she enjoys the contrast. Eighth place in Baal is a solid result for Anderson, coming after finishing 18th at the Loenhout Bpost bank trofee and 11th at Diegem Superprestige. She’s not yet competing at the level of the top women racers like Sanne Cant or compatriot Katie Compton, but for Anderson to be here at all is something of a redemption story. Born into a sporting family in Vermont, Anderson had a promising career in downhill skiing before her future in the sport was curtailed by knee injuries. In high school she began riding a road bike, and in college competed in road and cross races. 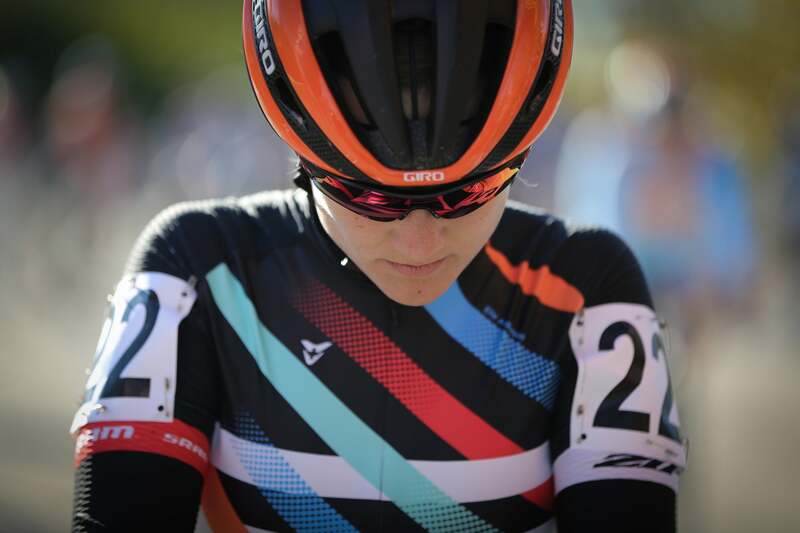 After two years of road racing, Anderson undertook her first full winter of cross, marking the beginning of her love for the discipline. In early 2012 she competed in her first National Championships, in Madison, but the race ended in frustration when she was lapped by Katie Compton within twenty minutes, and pulled out by a race official. Undeterred, Anderson committed herself and began a swift rise up the rankings. In late 2013 she raced in Europe for the first time and was overwhelmed by the intense atmosphere and professional set-up of Belgian racing. Something changed on that trip; Anderson was in love. The European experience paid off. In the 2014 US National Championships, in a cold and sunny Boulder, Anderson finished second to Compton after leading the race for the opening laps. Her talent had not gone unnoticed in Europe, and she signed for the Kalas-NNOF team. Living in Belgium as a professional, with the full support structure that entails, everything seemed perfectly poised to launch her career onto the highest stage. At first the dream seemed to be coming true. Anderson took three consecutive fifth places, including the Valkenburg World Cup. But as autumn turned to winter she was beset by problems. Illness, injury, and the difficulties of living with host families in a foreign country all contributed to a deteriorating situation. Anderson felt isolated and under pressure. She wanted to fulfill her obligations, and wanted the full Belgian professional experience, but in the end the compound impact of her problems was too much. She ended her season early, returned to the US and stopped riding her bike. During the spring of 2015 Anderson could hardly bear to ride the bike, and took some time out to consider her future. Eventually her self-belief, and drive, won out. Learning the lessons of the previous season, Anderson set up her own team, with sponsorship from Strava, who she also works for, and SRAM. The process of creating her own program and getting back to race fitness meant that she started the 2015/16 season late. Now the results are starting to come, and Anderson is a more complete, more experienced racer. This weekend she returns to the US National Championships, taking place on the historic Biltmore Estate in Asheville, North Carolina. 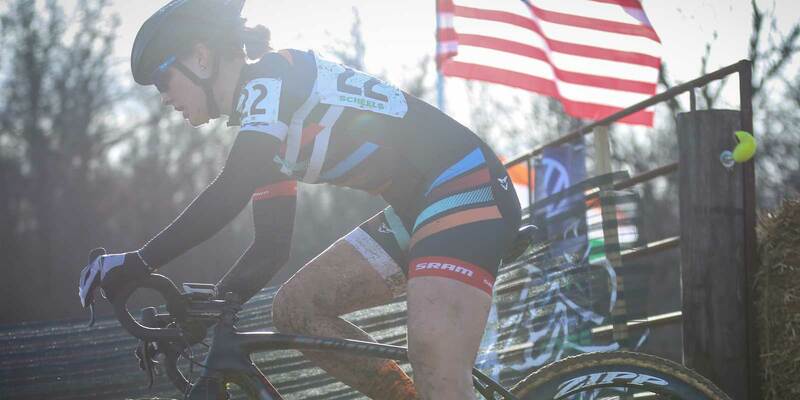 Katie Compton is still dominant in US women’s cyclocross, having won the title every year since 2004. She too had a slow start to the season, and is now building form towards the World Championships in Zolder in late January. But there is a group of riders slowly closing the gap, including Kaitlin Antonneau, Ellen Noble and Elle Anderson.